RANCHO SANTA FE — For any passerby who took a gander at the San Diego Polo Club field last weekend may have thought a Western movie was being filmed. The Wild West action taking place was actually the Cowboy Mounted Shooting demonstration between the first and second polo matches. The event was co-hosted by The Silver Dollar Ranch and The Roy Roger Rangers Mounted Shooting Club. The polo crowd had a magnificent time. 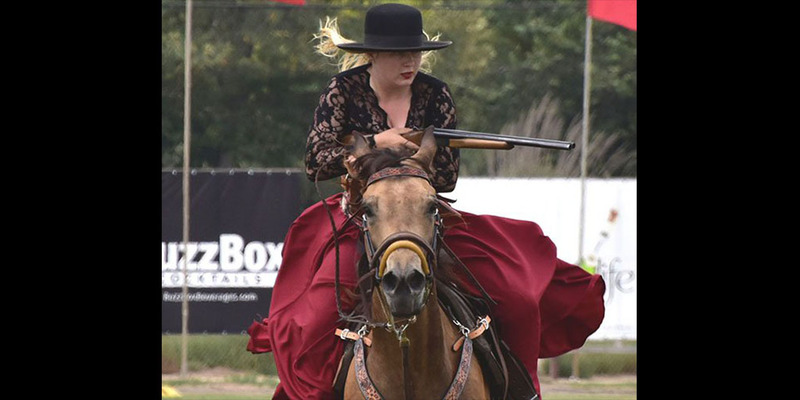 Leann Lawson, business manager at The Silver Dollar Ranch, said the Cowboy Mounted Shooting Association has more than 3,000 active members both nationally and internationally. Lawson went on to say that competitors use a total of two .45 caliber single action handguns loaded with black powder blanks. There are more than 65 courses and must shoot at the 10 balloons per course. If a competitor misses a balloon, a five second penalty is tacked onto to their time clock. In addition to the handguns, Lawson said, there is also a rifle and shotgun division. On polo day, spectators were able to witness for themselves the speed, accuracy and skill this sport requires. Lawson shared that her whole family, including herself, participate in this activity. Their demonstration at the San Diego Polo Club was a great for everyone.